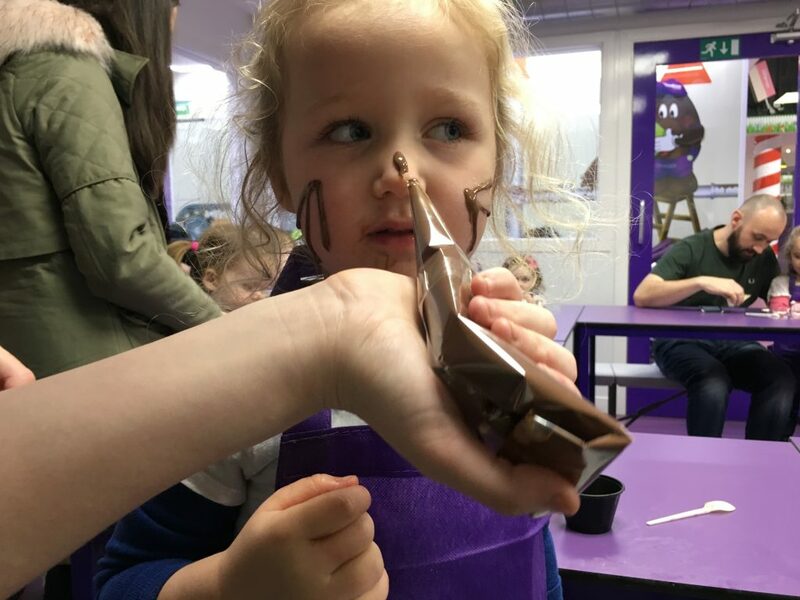 The tots workshop is part messy play; part art class; part eating a bunch of chocolate. 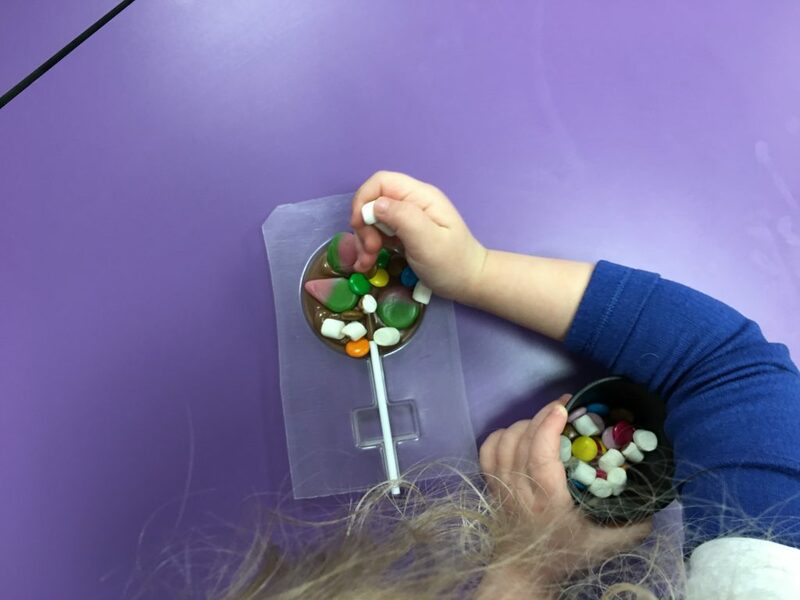 First, the kids were given a chocolate lollipop mould (with chocolate already in it), along with a little tub of sweets and treats which they used to decorate the lollipop/cram into their faces. 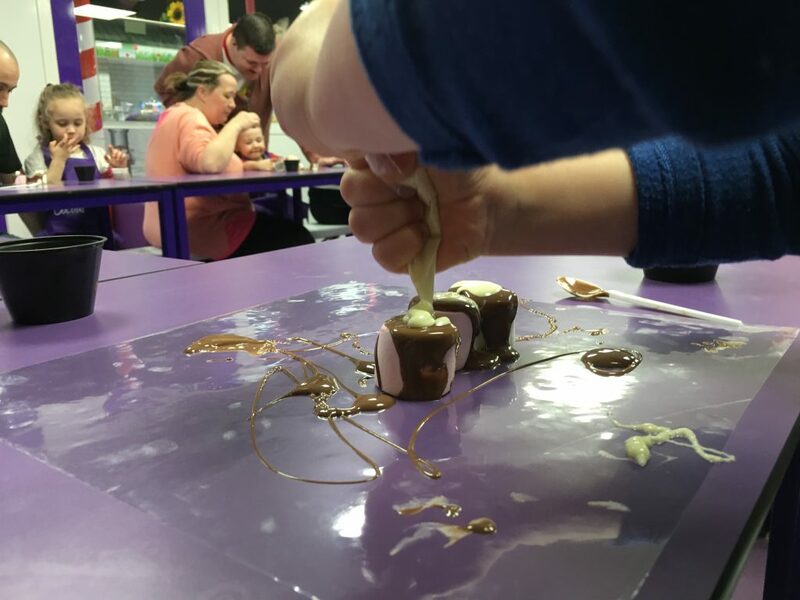 Then they were given a few big marshmallows along with 2 piping bags with white & milk chocolate for squeezing onto the marshmallows/lollipop/into their faces. The staff member taking the workshop asked the room who would like their face painted. 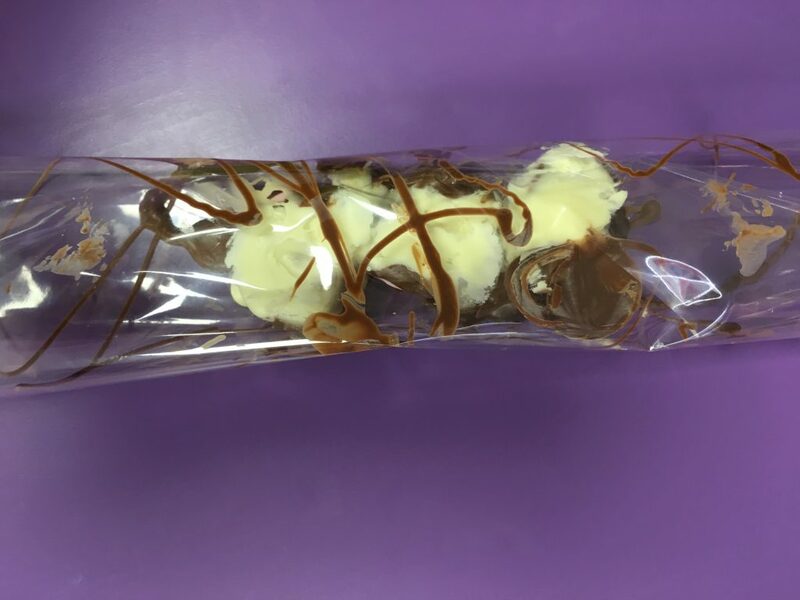 after a cheer went up around the room the staff then came round with some piping bags filled with chocolate for turning pre-schoolers into kitty cats! This was a massive hit with the little lady. And most of the other kids in the workshop if their faces were anything to go by. There was a section of wall down the front all covered with paper. 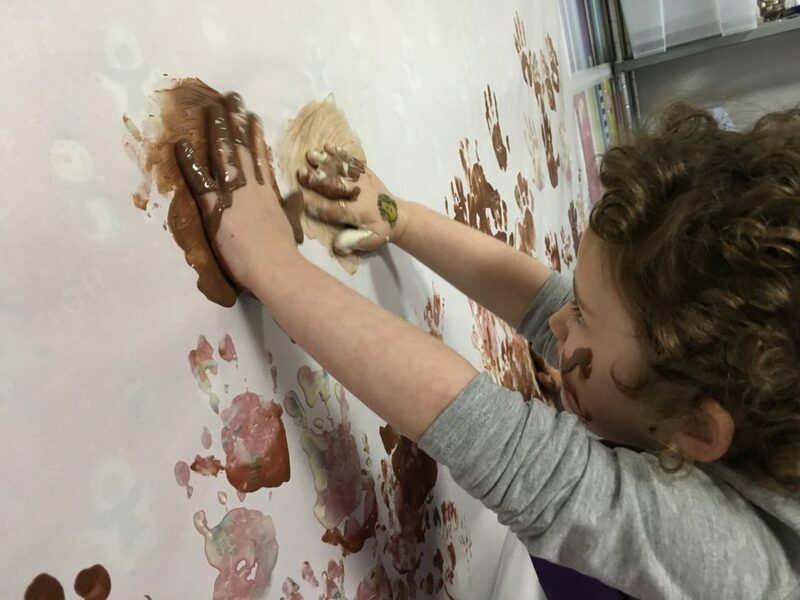 The kids were invited down there to dip their hands in a paint tray of chocolate, and make chocolate handprints on the wall. By this point the little lady was mainly just licking chocolate from wherever it happened to be on her person. Which was rather a lot of places. I didn’t count them at the time, but there were at least 15 young kids in the workshop and the staff were excellent with them. We moved from one activity to the next quickly and smoothly. The kids didn’t have a the chance to get bored. The sessions are different each week. Our experience was just an example of what you might do during the class. The sessions cost £6 per child and last half an hour. Kids must be accompanied by an adult. You can book in via the links on their website/facebook page or by giving them a call. This was probably one of the quickest half hours of my life. 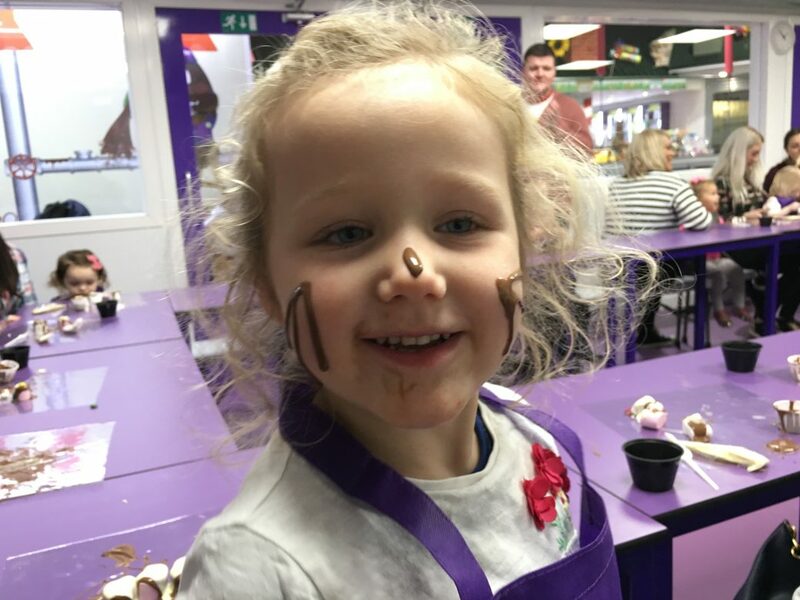 It was crammed with chocolate based activities and messy play. I was sweating by the end of it and all I did was supervise. But the little lady absolutely loved it. She had a wonderful time. And a lot of chocolate. Cocoa Bean is located within Soar at Intu Braehead, formerly xscape, at Kings Inch Rd, Braehead, PA4 8XQ.